Abaco’s sheltered Marls region is big. So big that it could swallow 13 Manhattans within its 300 square mile footprint. 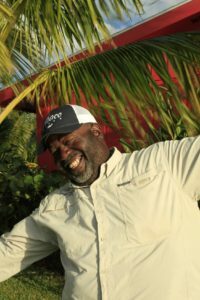 Instead of sputtering cabs and people crammed into skyscrapers, however, this wilderness flats area is peppered with unpopulated pine forest islands, mangrove cays, and a prodigious bonefish population. 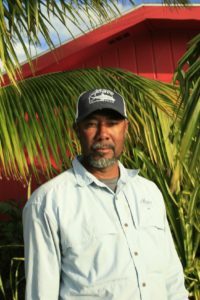 From Abaco Lodge’s central location, we fish the Marls from as far south as Cross Harbour to its northern extremities off the west side of Treasure Cay. A twenty-minute skiff run due west puts anglers within striking range of the Marl’s ocean-side edge. 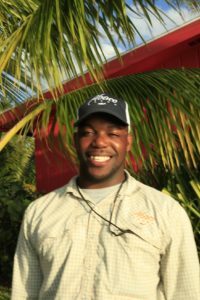 And from all points in between, Marls bonefish average 2 to 4 pounds. Larger fish in the 5 to 8 pound class, although fewer and harder to seduce, are also found in good numbers. 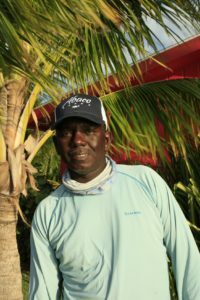 Permit and juvenile tarpon shots are frequent enough that you should be prepared with gear for targeting both species, and barracuda, jack crevalle, plus various shark species also call the Marls home. But bonefish generally rule this kingdom thanks to an ideal mix of sheltered habitat and prime forage sources through the seasons. Fishing in the Marls is done from our meticulously maintained Maverick flats skiffs. Wading opportunities also exist. From the lodge dock, runs to the flats vary from 10 to 45 minutes. All skiffs are fishing (and comfort) friendly, with padded seats, backrests, line mats and lean bars on the bow. They’re also equipped with first aid kits and an emergency satellite phone. 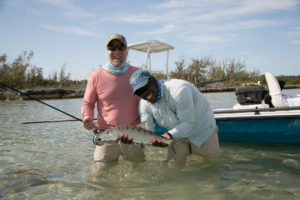 In addition to wonderful flats, Abaco has incredible blue water fishing. We are happy to coordinate a day, or two, with the best captains available. Target species include: marlin, sailfish, dorado, wahoo, and tuna—depending on the season. Arrangements can be made at the lodge, but the best captains book early and we recommend you do as well. There will be an additional charge for this type of fishing. Each day, guides and lodge management decide where to fish based on weather conditions, tides and seasonal activity. 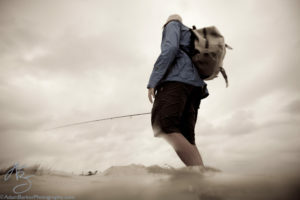 You should express any special preferences to the lodge manager, such as wading versus boat fishing. We’ll work with your guide and try to tailor your day accordingly! Bonefish: We recommend 9ft, 7-8wt. rods. Under normal conditions, you can make a delicate presentation with a 7-wt. rod, a long leader, and an un-weighted fly. A fast 8-wt, on the other hand, helps you punch flies through the wind. Use saltwater capable reels with adjustable drags and capacity for 150 yds. of 20lb. test backing. Weight-forward bonefish lines should be paired with fluorocarbon leaders. A general rule of thumb is 10’ 10 lbs for leaders. Bring extra leaders and a few spools of tippet in the 8-15lb. range. 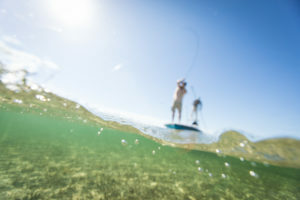 Fly wise, the list of options is endless and selections depend on the kind of flat you are fishing, its bottom color—turtle grass or sand—and depth. A few we wouldn’t want you to go without include: Puglisi’s spawning shrimp, Miehieve’s Flats Fly, Kwabbit, mink shrimp, Veverka’s mantis shrimp, spawning mantis, and of course the Gotcha. Predators: For barracuda and sharks you want a stout leader with a wire bite-tippet, about 12 inches long. Use a haywire twist to combine sections of mono to wire. Flies for ‘cudas include any and all needlefish imitations. For sharks, we like large poppers in blood-red or other bright, attention-grabbing colors. The topwater takes are awesome. Sage produces many of the rods we use regularly. In addition to a great lifetime warranty, the company engineers high-performance options perfectly suited for this fishery. Skiffs: A brand new fleet of high-performance Maverick Mirage HPX-Vs awaits you at Abaco Lodge. 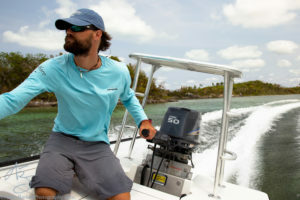 These technical poling skiffs have stealthy, extremely quiet hulls that draw minimal water when pushing toward tailing bonefish in the ultra-skinny stuff. Open-water handling, on the other hand, is unparalleled: fast and smooth in the surliest conditions. Additional angler-appreciated details include lean bars and removable cushioned YETI coolers—because nobody wants lukewarm beers. Chicone’s Bone Appétit Hook: Size – 2, 4 I Color: Pink, White, Tan, Orange. If you wish to buy some of these flies prior to your trip, or if you are looking for more information, you should visit Drew Chicone’s website.